Cyril Gerber Fine Art is presenting a solo exhibition of paintings by Margot Sandeman. Born in Glasgow she was the daughter of Archibald Sandeman 1887-1941, an accomplished artist and Muriel Boyd Sandeman 1887-1981, an internationally known embroiderer who trained with Jessie Newbery at Glasgow School of Art. She grew up in a home that reflected the influence of Edwin Lutyens, William Morris and the Arts and Crafts Movement. A prolific painter, Sandeman continued to work until the end of her life, aged 87, leaving a substantial number of paintings and drawings in her studio. This new exhibition in Cyril Gerber Fine Art is a further selection of some of these idyllic scenes of figures in nature, still life and drawings and includes some previously unseen works. Also on show will be a selection of paintings and drawings gifted to Margot by Joan Eardley. A student at Glasgow School of Art, Margot’s talent was recognised early on by Hugh Adam Crawford, the Head of Drawing and Painting. She and Joan Eardley were amongst a very small number of outstanding students selected for special attention. Margot and Eardley, who became a lifelong friend, made many painting trips to Corrie, Arran, which was her family summer base. Sandeman had an individual style, quite different from most other contemporary Scottish artists. She was a ruminative, romantic painter of pastoral subjects which always have an atmosphere of quiet tranquillity. She painted what she loved, and for her, nature was central. Although lyrically simple, Sandeman’s work possesses a real rigor and power beneath their apparently gentle exterior. She gave vivid life to the simplest of still life’s, family portraits and landscapes. Her series of large canvases of Bathers, echoing Matisse and Seurat, or a Japanese Master, has austerity, tonal harmony and harnessed energy. She had a passionate love of words and poetry, which is evident in her collaborative works with her contemporary Ian Hamilton Finlay, based on his texts and publications from the Wild Hawthorn Press. Winner of the Guthrie Award, 1964; the Anne Redpath Award, 1970; the Scottish Arts Council Award, 1970 and the Laing Competition, 1989, her works are represented in numerous private and public collections in Scotland and further afield, including the BBC, The Scottish Arts Council, Contemporary Art Society and the City Art Centre, Edinburgh. She has had several solo shows in Edinburgh at the Talbot Rice Gallery, Demarco Gallery, The Open Eye Gallery and in Glasgow at Gerber Fine Art and Compass Gallery. 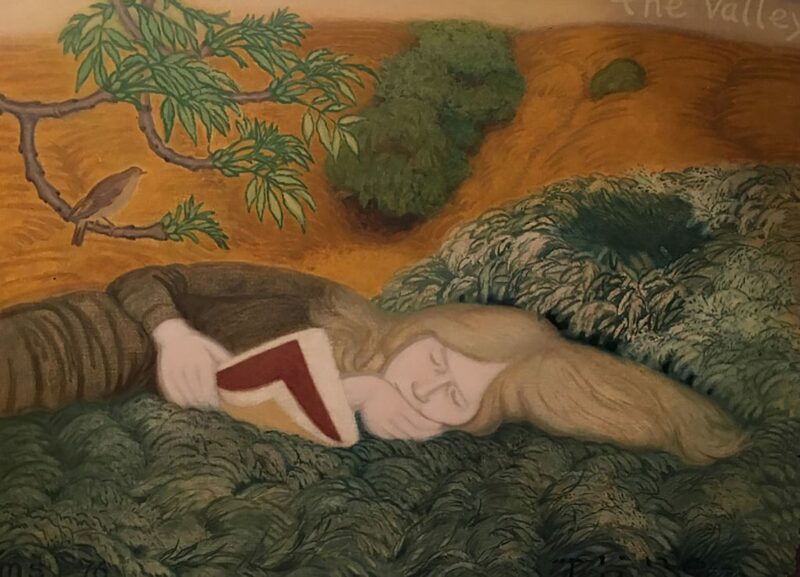 Margot Sandeman’s work was exhibited in a major exhibition in the Lillie Art Gallery, 2011 and the ‘Modern Scottish Women, Painters and Sculptors 1885-1965’ exhibition at the National Galleries of Scotland 2015.